This paper describes a project which focused on two groups of post 16 college students working together using a range of iPad applications. The potential of digital technologies to engage students in the curriculum has been prolifically documented. Less is known about how technologies might help students engage with each other. In this paper, we suggest iPads can mediate and enhance new relationships between distinct cohorts of students and thus create new opportunities for social learning. 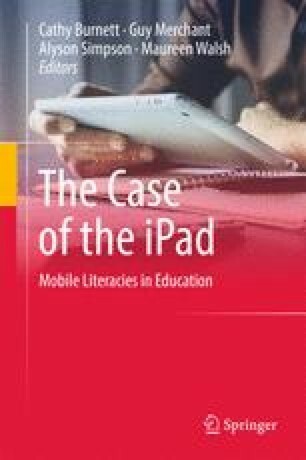 This research reveals how the specifics of the design and materiality of iPads affect the nature of the relationships amongst research participants both within and beyond the literacy classroom, and how a range of applications can be used to perform ‘social networking’ both on and offline. The setting is a college in the north of England; it’s a bleak day and as the two visitors make their way up the steep incline and past McDonald’s, the boisterous voices carry chaotically in the blustery wind. The kids are confident and lively, easily carrying their college stuff in fashionable bags. Coming in closer to the college the building is impressive; a strikingly tall iconic multi-storey complex with a spanking-new clean construction situated close to the city’s major transport links—buses, trains and trams. Some kids arrive on bicycles—as is the fashion, and in twos and threes the ultra cool clandestinely inhale deeply on cigarettes. Following the long walk leading to the main entrance, the students are faced with a set of barriers; they have to swipe their student cards to access the rest of the building. Proceeding on from these prominent security measures, is a steep set of steps that lead to a noticeably long atrium area overseen by balconies, then further stairs to a canteen area, a lift and corridors to first floor curriculum areas of the College. These teens are ‘coming of age’, waiting for afternoon classes for re-takes of exams failed at school; for university entrance courses; for professional training in hairdressing, engineering, media … As the visitors, two researchers enter the vestibule, they become aware of a more muted gathering; they are protectively ushered by two women, caring and attentive, checking off names in notebooks, looking in student bags—a very different melange than the ‘youth presence’ hanging and geeking out elsewhere. MITP Digital 2020. 2017. Digital 2020. Digital participation. http://www.digital2020.org.uk/participation/dots. Accessed April 2017.